Glasscoat International required a detailed understanding of the conjugate heat transfer processes which take place during their cold curing process. Wilde provided bespoke training and a modelling methodology to enable them to implement CFD and investigate a number of design iterations. Glasscoat International specialise in the colour coating of glass containers, and supply bespoke production machinery to customers worldwide. Effective design of this process required a detailed understanding of the conjugate heat transfer processes which take place during this stage of the process. Wilde initially developed a CFD model of the infra-red production process based on supplied geometry and operating parameters using ANSYS CFX. The process required modelling of the rotating coated workpieces as they moved through the infa red tunnel, as well as a suitable model of the combined radiative and convective heat transfer phenomena. A transient CFD model was developed, with a sliding mesh interface used to model the rotary motion of the workpieces, and CFX Expression Language was used to implement time-varying boundary conditions on the tunnel walls to simulate the translational movement of the workpieces relative to the hot infra red panels without the need for additional computationally expensive mesh motion. In order to accurately model the heat transfer phenomena the Monte-Carlo radiation model was implemented which has the ability to model radiation in semi-transparent media. Further to this a mathematical model was developed to characterise the variation in coating properties as it cured during the radiation stage. Wilde then provided problem-specific training over the course of 2 days, focussing on the analysis techniques pertinent to the client’s modelling task. Wilde allowed Glasscoat International to develop computation models of a IR based Pre-Heat curing oven prototype. With the implementation of the CFD based models, design parameters could be indentified at the design stage, including IR emitters energy levels, accurate understanding of convection heat currents within the boundaries of the oven and temperature distribution. Client was equipped with the tools and skills to enable them to develop their own models and analyse future designs. By adopting CFD modelling techniques, the client benefitted from cost and time savings of virtual prototyping over expensive iterations of physical prototype builds. 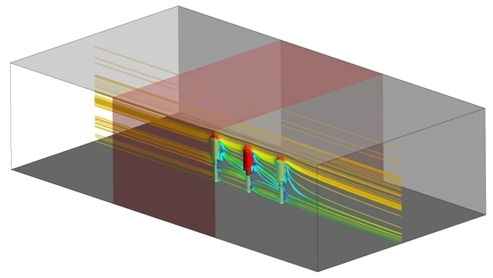 Design improvements based on a detailed description of physical processes, attainable only through CFD modelling.